You can’t beat Pickled Beets…another day of canning! Best Pickled Beets Recipe for your garden harvest! Today I have all my water bath canning equipment out ready to can some pickled beets. This week we can start harvesting our beets. We are guilty of sneaking a few smaller ones the last few weeks and boiling them with the greens still attached. Cooked this easy way and just served with butter, salt, and pepper on them, beets are really delicious. I love beets! In fact, I’m a big fan of all root vegetables. For me, it’s the idea that they are loaded with minerals and goodness from the earth that makes me love the “earthy” flavor that they all have. Eating them seems like a healthy thing to do. Pickled Beets are versatile and can be used in many ways! 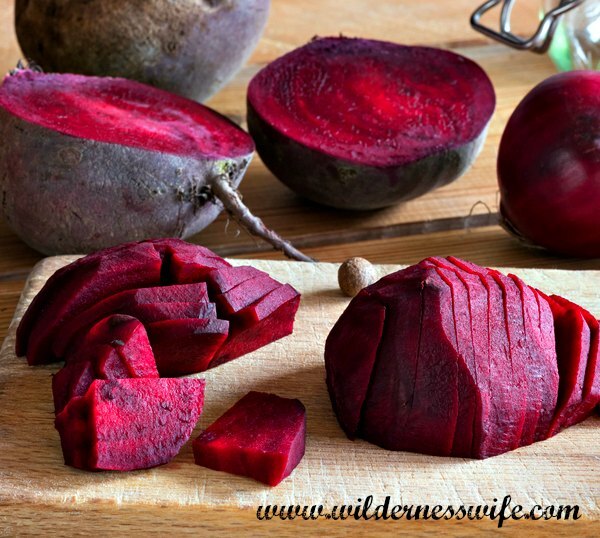 Beets are an extremely adaptable veggie with a number of ways to cook and serve them. You can roast them, boil them, and even pickle them. Pickled beets are a very versatile side dish. 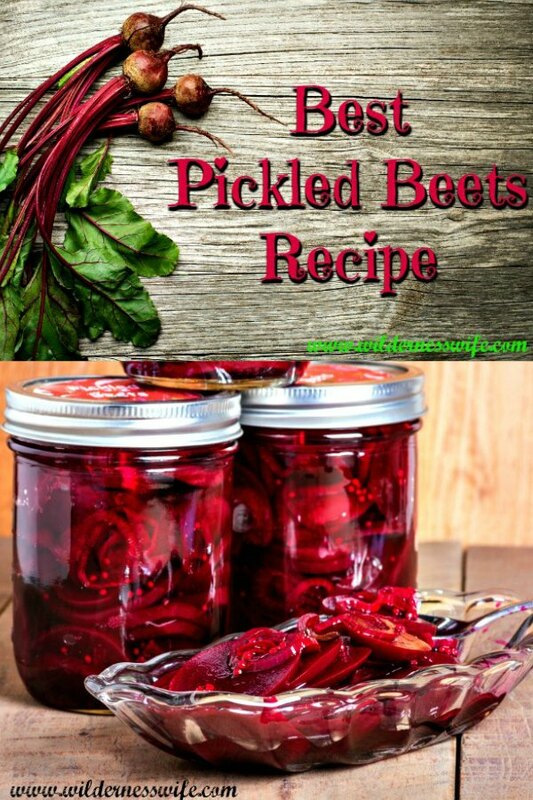 You can eat them right out of the jar, add the pickled beets to salads, or serve them along side a number of main dishes. Serve pickled beets as German cooks do, as an accompaniment to any kind of cold meat. 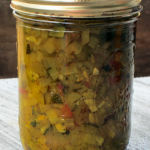 This tasty pickle adds a spark to leftover chicken, turkey, pork or beef. Yu can make your pickled beets part of a tasty “relish” tray joined with carrot and celery sticks, olives, and a variety of pickles. Drained, chopped pickled beets add a zing to potato salads of all kinds. Use pickled beets instead of tomatoes in winter green salads. Combine baby spinach, pickled beets, orange or tangerine sections and a little red onion for a tasty salad. Pickled beets stand up well to the stronger tastes of gourmet greens like arugula and mesclun mixtures. And trust me, there is something very satisfying about canning your own pickled beets. They are one of the easier items to can. Because you use vinegar in the process, the acidity allows you to use the boiling water bath method of canning as opposed to having to use the pressure cooker canning method. Canning your garden produce gives you great quality, and is so a money saver. Try this pickled beet recipe. 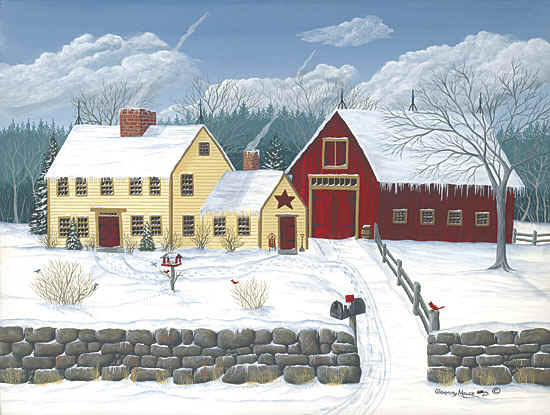 Its one of my favorites and you will be able to enjoy your garden through the winter months! Cut stems to about 2 inches, and leave on the tap root. This will help keep the color when you boil the beets to loosen the skins. In a large pot cook the unpeeled beets until fork-tender (do not overcook) cool and then remove the skins. Reserve 2 cups of the beet water. The skins are easily removed. Take the beets one at a time and hold them under running water and gently rub the beet to remove the outer layer of skin. Cut off the tops and tap roots. Slice the beets about 1/4-inch thick or you can cut them into cubes. Pack the beets snuggly into sterilized canning jars being careful not to bruise them. Add 3-4 whole cloves to each jar. In a large saucepan combine the sugar, water, vinegar, ground cloves, allspice, cinnamon and remaining whole cloves; bring to a boil and simmer for about 10 minutes making sure that the sugar granules dissolve. Quickly pour brine over the beets in the jars, leaving 3/4-inch headspace (the liquid should go no further than the shoulder of the jar!). Remove air bubbles with a plastic knife or other small tool. Wipe the jar rims clean, put on lids and hand tighten the bands. Process in a boiling water bath for 12 minutes. Remove from water and allow to cool on a rack. As with all pickled items, they taste best after a few weeks. I love beets, but my husband hates them. This would be a great way for me to be able to have beets year round without his help eating them! It’s great to hear that my recipe will help with the marital bliss at your house! :-) I am fortunate that my hubby loves everything about beets from beet greens to beet salad to the pickled kind. I also love being able to use every bit of my gardening efforts and let nothing go to waste. Canning helps with that and sees up the veggies we have in abundance including beets and zucchini. These look delicious! Thank you so much for linking up at Tasty Tuesday! Your recipe has been pinned to the Tasty Tuesday Pinterest board! Please join us again this week! I’ve actually never had these…maybe I should! Will be making these for my husband! Thank you for linking up to the Bloggers Brags Pinterest Party. I have pinned your post to the Bloggers Brags Pinterest board. This is a taste from my past! My mom made these when I was little and have forgotten about them. Every holiday she would boil eggs, put them in a jar and pour pickled beets over them. She would put them in the fridge for a couple days and pull them out for our special dinner. What a great memory! I just wanted to let you know that I featured your wonderful project on homework. Thanks so much for sharing it on The Inspiration Board. It makes me so happy to see beautiful creativity linked up! Thank you! Glad you liked it! Not only do they taste good but the jars look so beautiful sitting in my jelly cabinet – like sparkling rubies! Stopping by from the Grand Social! I hated pickled beets when I was growing up. But when I met my husband, his grandmother made the most delicious pickled beets. I wish I had her recipe, but then I would have to put them up and I don’t do that. I love love love beets! I hate pickled beets! Sorry but it had to be said — why ruin a perfectly wonderful beet by pickling it? Yours do look beautiful and I didn’t mean to sound like a brat! I was just reminiscing the other day about how yummy my Mom’s beets are — had some on my last trip home. I asked her to mail me some but I don’t think it will happen! Thanks for sharing! Just stopping by from the GRAND Social Linky Party, hope you get a chance to do the same. My hubby Bill loves pickled beets so I always make them for him. Everybody has their likes and dislikes. It’s what makes the world go round. It would be a very boring place if we were all exactly the same. My mother used to can pickled beets all the time. I loved her beets. I have never canned any but it is something I would like to try someday. I am going to pin your post!! Pickled beets are my favorite topping for salads. I bottle them about every other year. I didn’t get any planted this year and I am totally out. Darn, store bought beets do not compare. Sometimes my cousin gives me beets. Hopefully she’ll have extra this year. I use the reserved water also. I think our recipes are very similar if not the same. YUM! Thanks for sharing with Share Your Cup. I will be canning chili sauce tomorrow. There’s nothing like the beets that you can yourself! Was just going to make pickled beets this week! I love them! My Bill loves them too. He has a hard time waiting for them to “pickle”! 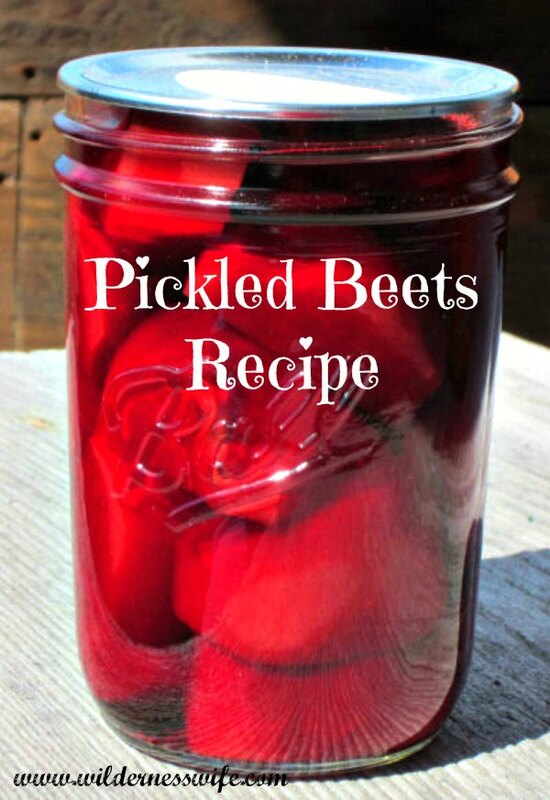 I’ve only ever had canned pickled beets… when I was a kid…Not my favorite. But THESE, I would try! Have you ever had the cinnamon spicy apple rings that come in a jar? My grandmother would often serve them with a pork entree. Well, these pickled beets are like that. 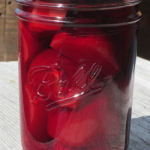 I just blogged about making pickled beets too! But I didn’t use any spices – sounds interesting! I’ll have to check out your blog as I have never done them without the spices… I am always open for new things. I love to can as it makes all that work in the garden more beneficial. More people should go “old school” and try canning. I’ve got a bucket of green beans that I picked this morning and will be doing up dilly beans today. 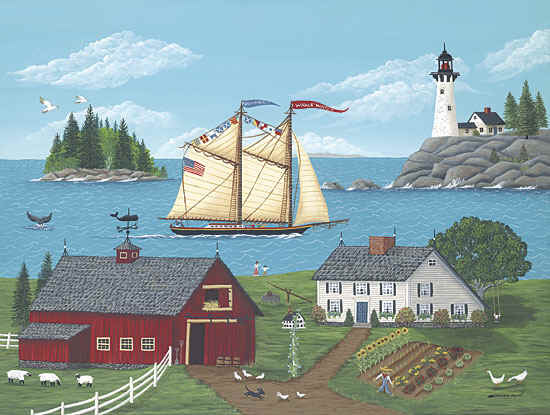 my grandparents were in Pembroke maine and lubec Maine. I noticed you had something about the machias blueberry festival and wondered where you were. I’m in Sherman, in southern Aroostook County, right on the edge of Baxter State Park where Mount Katahdin is but Bill and I always make a couple of trips down to Machias every year to our favorite place for lobster rolls, The Bluebird Ranch! Love the ride down there and always take a ride out to the Quoddy Head Lighthouse. I absolutely LOVE pickled beets, or actually I love beets prepared any way. I used to preserve abount 2 dozen jars of pickled beets each season. Now however, with just my husband and myself for most meals, I have not done so for the last few years, and how I miss them. Great post, and beautiful blog. I agree! Homemade Pickled beets are “delish”! Glad you enjoyed the blog! Be sure to stop by again! Oh My! These look amazing! I just love beets and now I’m inspired to can some. Thanks for sharing! They are gorgeous….like jewels in a jar!! And they are a great addition to a anipasto platter, a relish tray, or an appetizer! I love pickled beets! Brand new followers and I found you at The Morristribe. Thanks for sharing your recipe! Oh, I’m very glad to do it! And it’s my Nana’s recipe from long ago. She’d be 122 if she was still with us! She actually drove a horse and buggy…never learned to drive a car! The old recipes are the good one’s! hi, i’m following the friday blog hop. i would love for you to visit my blog and follow it if you like it. Your black & white photos are stunning. I love black & white, it adds drama to the most ordinary subject! I love pickled beets. 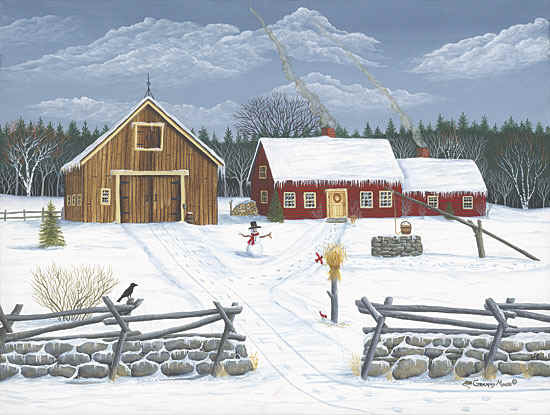 Some of my fondest memories of when I was younger was accompanying my aunt out to her old barn where she kept all of the canned goods. Those beets looked like glistening jewels in the jars when she dusted them off. I can remember her and my Mama planting them, picking them and canning them. Great times back when I was younger. I have not canned any pickled beets in a while. I think I need to get busy with it. New follower here from the Friday Blog Hop. Glistening jewels ……exactly! There is nothing more beautiful than a shelf of home-canned veggies! As an artist, I love arranging them in my kitchen as part of a “still life” on the counter! Looks so homey!! And opening them in the winter is like pouring some summer sun into the kitchen! Thanks for stopping by!